Playing a melody with fourth or minor sevenths jumps on a bass guitar is usually a purely horizontal movement on the fretboard, staying at the same fret and just switching strings. It's not a problem staccato, but if I'm trying to keep the notes connected, I find it difficult. pick up my left hand finger and move it over to the new string: always results an audible gap. use two fingers: feels cramped, takes me out of my usual one-finger-to-a-fret position, often leaves me tangled up trying to hit following notes. use some other part of my finger (like underneath the knuckles) for the higher string, so I can switch strings by rocking my finger back and forth a little. Feels awkward, doesn't seem to work reliably. But maybe one of those techniques would actually be useful if I stuck with it? Any advice welcomed. I have definitely noticed that this can cause some amount of issues depending on what the context is. I feel like one important thing is that you should try to become more comfortable with stepping outside the one finger per fret approach. That is not a bad thing to do but to be able to step away from it can add to your playing. If I find myself needing to go back and forth between notes on the same fret, especially at faster tempos, I either like to use a finger per string, or use a barre approach (option 3 from your question). A finger per string is nice because you can control articulations much better and don't need to worry about muting any strings. You may feel uncomfortable with this at first but you may need to switch which fingers go to which strings. Experiment with it until you find something comfortable. I typically find that putting my second finger on the lower string and using my third finger for the other note most comfortable but this is also dictated by where you are on the neck. If I am higher up on the neck, it is more comfortable to use my first finger on the lower string and second on the higher. It seems weird to me but it may be more comfortable for you if you put second finger on the lower string and first finger on the higher string. Experiment and find something comfortable. If it is really uncomfortable, you should probably stop because it may just be your body telling you that it is a bad position and that it can actually cause long term damage if done too long/too frequently. With a barre it is a bit harder to control articulation and there can be difficulty in trying to mute the strings that aren't being played. 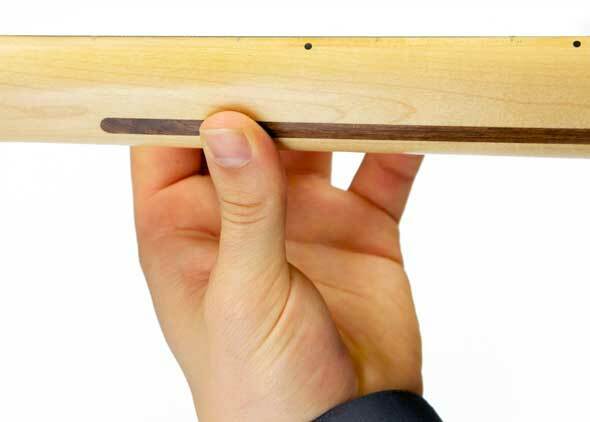 This also requires a good amount of force to properly accomplish, specifically as compared to a guitar barre, so it may be uncomfortable for people with smaller or weaker hands. The other problem I sometimes find with the barre is that it is a little less intuitive for me to get my hand in position for, most specifically when you have been playing on a different fret and are changing positions into the barre. It may not be the best choice for you in the end but it can be a very good idea to practice this concept using the one finger per fret approach. You mentioned that there is a noticeable gap; if you can practice trying to reduce the gap, it can be good for improving your ability to move around your instrument with precision. I tend to play a lot of chordal sorts of parts on my bass, so I tend to stick to the one finger per string because it allows more control of articulation. I'm often trying to play a bass part that may have different articulation than the chord part, so having that extra control is rather valuable to me. Again, experiment and find something comfortable. Don't force yourself to do anything to uncomfortable because you are likely to injure yourself and then you will not be playing any fourths or sevenths at all. Not the answer you're looking for? Browse other questions tagged bass-guitar or ask your own question.